What if everything you’ve been taught or learned about money, wealth and abundance was out-of-date or incorrect? Welcome To Being You, With Money! In times of great financial change, what if you were willing to look at the infinite possibilities instead of the problems? There's no such thing as a money problem. There is only a problem with what you are willing to receive! What if the universe actually desires to support you in totality --- and all you have to do is start to ask questions? What if living in total abundance was a question of starting to RECEIVE? 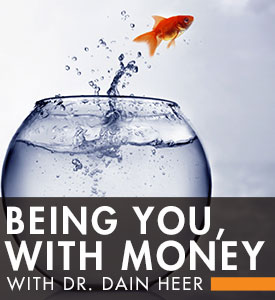 During this special one day class Dr. Dain Heer will introduce you to a totally different way of functioning in the area of wealth and abundance! You'll go home with a series of tools and processes that can help you to finally really change your problems with money — and your whole financial reality! Money follows joy; joy does not follow money. What if generating money and having money was fun and joyful? What if, in having fun and joy with money, you receive more of it? What if receiving more would allow you to contribute more to you, to everyone around you — and the world? What would that be like? If you really would like to change the world, could you do that easier with more money or with less? Just asking! Are you ready to start creating the life and world what you've always said you desired? If you purchased the online version: Please allow up to 48 hours for your ACTV online seminar replay to be enabled & login information emailed to you. You will also receive an email with MP3 download instructions immediately upon purchase.